The lady behind the info counter smiled and laughed: "Oh we had the man who was the subject for that painting in here a few weeks back," she chuckled. "The artist had aged him by about 30 years or so — he was a little surprised — but once he got over that, he was rather wrapped in the image and only hopes he looks that good when he is 70!" We were in the small hamlet of Wirrabara, in the southern Flinders Ranges of South Australia and had come to the visitor centre (housed in a craft shop) for the painted silo we knew was there but we couldn't see from the main highway. It's a small issue you'll find all over; the signposting to these great works of art is either poor or non-existent. Still, you'd think a bloody huge grain silo would be obvious (and in most cases they are), but sometimes, just sometimes, they hide from you! We found our somewhat obscured silo on the road to the Wirrabara Forest and it whacks you in the eye as soon as you see it. It was painted by Australian street artist, 'Smug', aka Sam Bates, in a seemingly improbable three weeks from start to finish. It's an amazing piece of modern rock art and would rate as one of the best we've seen on our travels. Like many of the artists who have painted the silos in Australia, their work is international and adorns walls, power stations, water towers and buildings all around the world with Smug having a vast repertoire as his legacy (for an idea of his work, just Google: Australian street artist, 'Smug'). And, like many towns, Wirrabara has a little more to offer than just the painted silo. 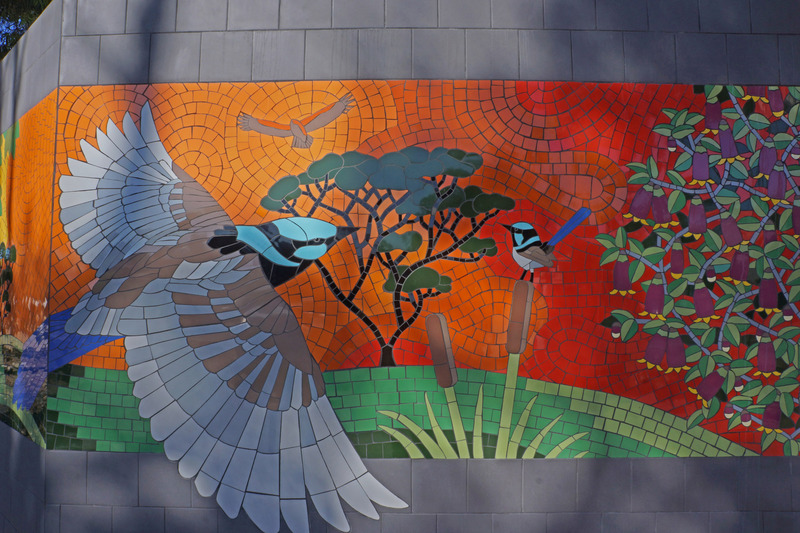 Apart from the camping and picnic spots out at the nearby Wirrabara Forest, the town has a mural depicting its timber-getting heritage, while a short sculpture trail along the local creek depicts many Australian animals — some furry and cuddly, others not so endearing. Sadly, the local pub wasn't serving counter lunches, so we headed over the range the short distance through a picturesque gorge to the small seaside town of Port Germein, where we found sustenance at a local cafe, close to the famous jetty. or blue swimmer crabs which the area is noted for. With a small caravan park, a pub and store, all within a short walk of the jetty, and the rugged grandeur of Flinders just a few kilometres away, it makes a great base to explore the region. Our travels looking at silo art had started after leaving Melbourne and heading on the main highway towards Adelaide a few days earlier. 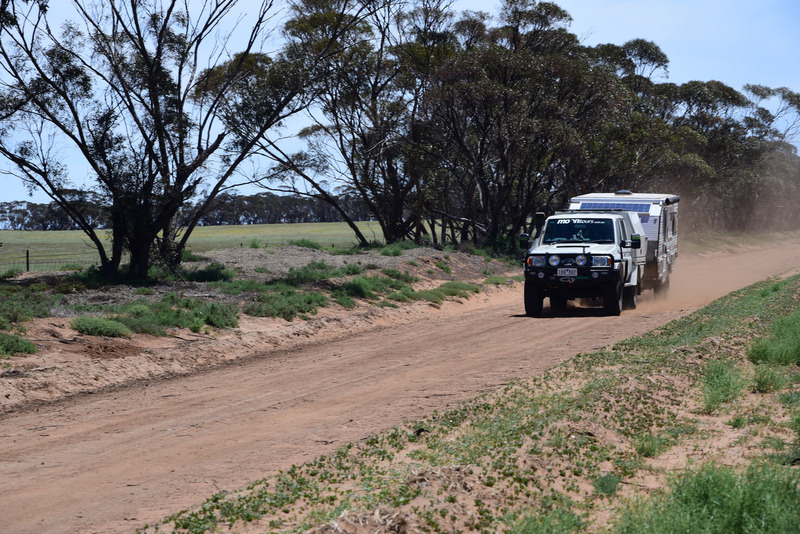 We had pulled up for the night at a 'free camp' not far from Bordertown, before cruising on to Coonalpyn next morning. You can't miss the painted silos here; they are right beside the highway. Painted by Guido van Helten (check his other works out on Instagram) these grain storage bins were the first to be painted in SA. And they stop a lot of travellers. While we were there, at least 20 vehicles pulled up; some for just a quick stop and photo, others for a longer stretch of the legs and a pic, while others wandered across the road to the Silo Cafe for a coffee before taking a photo. Just down the road, the post office now acts as a bakery while another cafe 100m further on, serves coffee and cakes. There are also a couple of other murals around the immediate vicinity of the silo with a spectacular bird and echidna attracting a lot of comment from passersby. From there we had headed north to Wirrabara before turning south once more, this time to the Murraylands and Waikerie and its parrot and yabbie adorned silos painted by Jimmy D'vate. 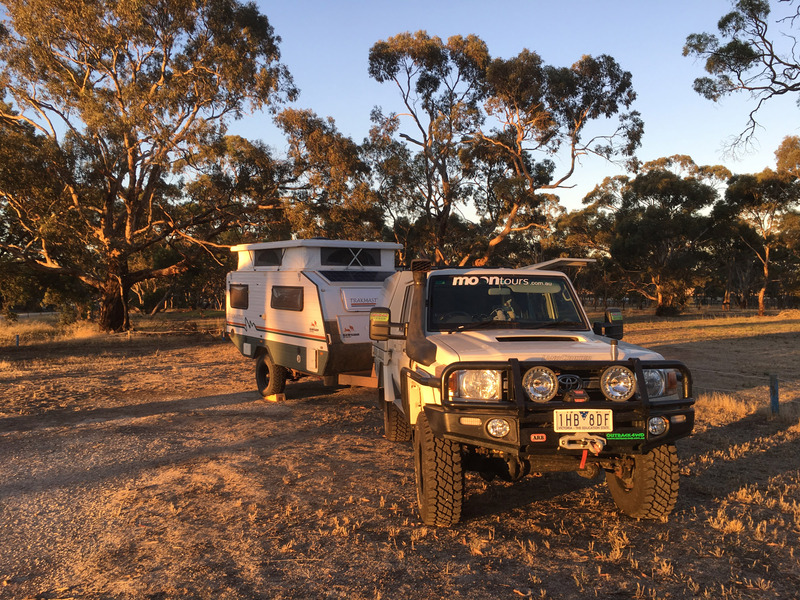 There are a couple of good camping spots around Waikerie but we made a mile or two before pulling up on the banks of the Murray at the council-run camping spot in tiny Moorok. Next day we started down the Silo Trail of western Victoria with the first point of call being Patchewollock. The silo here was painted in 2016 by Finton Magee and depicts a long, lean and lanky, local grain and sheep farmer; it's a fitting and evocative image of a typical mallee farmer and the challenges they face every day. Heading south to Lascelles we found some dirt roads (you don't have to — we just do!) before stopping to admire the work of 'Rone'. Famous for his haunting paintings of beautiful young women portrayed onto old worn backgrounds, his work is found on walls and in galleries around the world. The Lascelles silo features a painting of a local farming couple, their experiences captured in their eyes and lined, weather-beaten faces. Tracking west we passed through the largish town of Hopetoun before turning south and stopping to admire the work of, 'Kaff-eine' on the silo at the no-horse town (population five — somewhere) of Roseberry. It was mid-afternoon by then, so we stopped a little further south for the evening at the small town of Beulah, which has a cracker of a small campground near the sporting complex and town swimming pool and right beside the dammed Yarriambiack Creek. The town also has a number of murals to admire while the Victoria Hotel has counter meals for lunch and dinner. 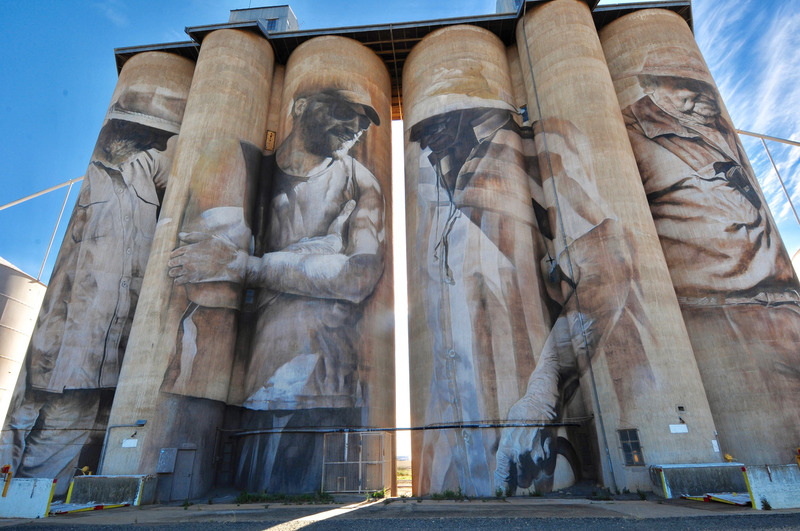 Brim, the town that started it all for Victoria is next and the four 1939-built silos were painted by the afore-mentioned, Guido van Helten. As the Silo Art Trail website says, " ....van Helten's mural depicts an anonymous, multi-generational quartet of female and male farmers". It's evocative and impressive. A little further south and off the main road is Sheep Hills; the silo here painted in vivid colours by Melbourne-based artist, 'Adnate'. A couple of local Aboriginal elders and two young children celebrate the rich heritage of the Aboriginal culture in western Victoria. Sadly the town has nothing to offer the traveller apart from the silo, the old pub on the cross-roads not far away, long closed. We continued our trek south to Rupanyup, where a couple of local sporting youths have been portrayed on the metal grain silos, close to the heart of the town by the Russian mural painter, Julia Volchkova. The town is struggling going by the number of abandoned stores in the main street, but the 600 people who call the place home are not calling it quits. The first Bendigo community bank in all of Australia was opened here back in 1998 and the local park is a beauty where a small, well-run council camping area is also located. Here we met a dispirited council worker who thought that the painted silo was a waste of money .... but he seemed to be negative with near everything; maybe the drought had got to him! Still, you can do your bit to change his mind and help the community out by pulling up for the night, having a meal at the pub, buying supplies from the supermarket or fuel from the servo — it all helps keep these places viable ­— and was one of the prime movers of establishing the silo art trail in the first place. From here we headed east on back roads passing the 'pub in the scrub' (at Logan, east of St Arnaud), on our way to Rochester which has one of the most striking painted silos in all of Victoria. Easy to miss on the way north through the town, the twin rock canvases depict a squirrel glider and a brilliant azure kingfisher, painted by Jimmy D'vate (check out his other works on Instagram). We then hop-scotched our way eastward, stopping overnight at Kyabram before heading to Katamatite and picking up the still to be designated silo trail at Tungamah. 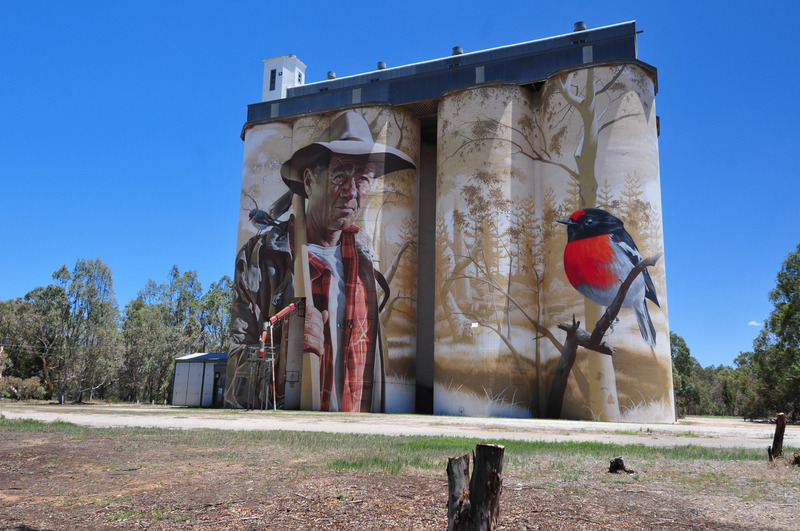 Here, the giant grain bins have been painted by Broome-based artist, Sobrane Simcock, and show a pair of dancing brolgas while a giant kookaburra looks on from the nearby steel silo. There's a friendly pub in the main street and just 200m away, a free bush camp on the edge of the Broken River — what more could you ask for? Just down the road is the small hamlet of Devinish where the silos there depict a WW1 nurse and her modern compatriot from the latest conflicts in the Middle East, painted by Melbourne-based artist, Cam Scale. They are very expressive and haunting images. The Goorambat silo is yet another artwork just a little further south and shows a giant owl and a river scene painted by Jimmy D'vate. The pub nearby is a great spot to enjoy a meal and a coldie (camping available) and while we were there, we discovered the town has another fine piece of art to see. The small local church just up the road has a delightful painting by Adnate, originally painted for the Wall to Wall Festival, which is now an annual and popular event in Benalla, just down the road from tiny Goorambat. So, what are you waiting for; hit the road to see some fabulous art. You'll never know who you'll meet or what you'll learn from visiting these places, that I for one in many cases, hadn't even heard of before. And if you are going to stay anywhere, do so in the smaller communities — they are the ones that need help in surviving and it will be appreciated by the always friendly locals. Victoria has another recently painted silo - the old silos at Fyansford (west Geelong). WA was the first state to get a painted silo, it being done in 2015 and pipping Victoria at the post by a couple of months. At last count, that we could find, there are now a total of 26 painted silos in Australia: 11 in VIC, six in WA, five in SA, two in NSW and one in QLD. There are a heap more water towers, tanks, power transformer boxes, walls and general street art. They have transformed towns and stopped travellers just whizzing through!